I'm sure you've been on the edge of your seat waiting for this transformation since I posted about it on Monday. Well, here it is. If this doesn't make you want to jump up and grab a paint brush and a gallon of white paint, I don't know what will. Just showing off my new camera. Have I told you I love it? Well, I do. It's Friday! Do you have exciting plans for the weekend? Me? I saved too much "stuff" for Saturday to be too excited for it, but we are taking pizza to the neighborhood park tonight. That will be fun. Wizzle, Wow! That's exciting. That makes for a busy weekend, especially if you're feeding friends and family after. Thanks, Rachel, Stacy and Kristen! amazing!!! I love the gold knobs. I have been a tad obsessed with gold lately. My someday future house will need one of these! Great work!! I am loving the gold hardware. Its fresh and different. Very pretty piece. WOW! I love your blog. I am always so excited to see what sad piece of furniture you are giving the Cinderella treatment to next. Absolutely gorgeous, Natty! You stage all of your pieces so beautifully. Have a great weekend! GORGEOUS!!! I am just in love with it all,,,especially that gold hardware! Seriously turned out amazing. The hardware looks awesome...and so do the photos. Beautiful!! What color of white did you use? It is hard to beat white. This piece really is stunning. Nice job! Beautiful! It's so classy and fresh. Just beautiful. Such an elegant piece. What a gorgeous transformation! :) Thanks for sharing! Love it! Especially the hardware! One word: gorgeous! What kind of camera did you get? I am in the market for a new one. Your pics look like they are out of the pages of a magazine!I'v been wanting to put a buffet in our dining room for awhile now....you've definately inspired me to find one I can transform! It turned out absolutely lovely! It's absolutely beautiful, love the gold hardware! Somehow I missed this piece. Love it!!! Amazing photos also. What kind of camera do you use? It's beautiful. I have this same old dresser, got it free on craigslist. Mine has the doors in the middle and the drawers on either side, but same hardware and shapes. I painted it a tealy turquoise, just the bottom, and left the top wood. I use it as a buffet in the dining room and store all my table linens in it. 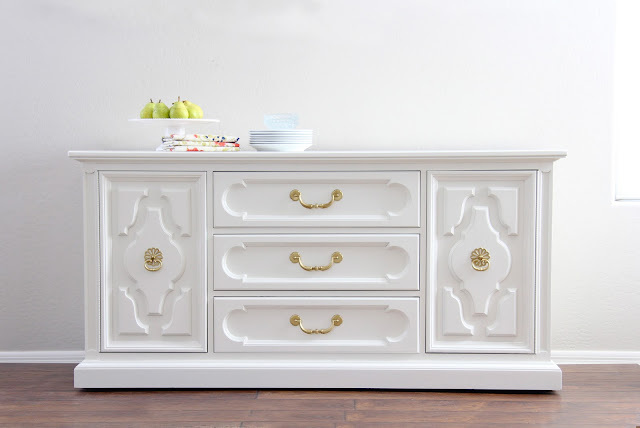 Gosh, that is a beautiful piece of furniture. I've been looking for something like that to use in my sun room to use for our flat screen 32 in. tav..Thought I could use it for another lamp to give added light, plus storage of other technology stuff(cable box, DVD player,etc. I'm so tired of dark cherry furniture and this white would really make a difference. Add colored acccessories..Do you any tuitorials how one goes about painting a piece of furnture like that? Brush, roller, spray gun? Do you sand and prime first? Do you remove the hardware and spray paint them separtely? How much would you say it would cost to paint a piece like that if you were hiring it to be done? How would you go about putting wheels(rollers)on for easy moving when necessary?